Yes, this cat’s eyes really were this green! Cat lovers rejoice, there is a coffee shop for you! The Cat Cafe opened in downtown San Diego this year to great fanfare from cat lovers (or people like me who were curious). I pictured myself sitting in a rocking chair with a cat on my lap, but that was not to happen. First of all, there was a wait to get in. They limit the room to 20 humans at a time, so I had to wait my turn. There’s also a limit of 4 cats at a time and, alas, no rocking chairs. We humans sat on the floor petting the cats…no holding them allowed. However, adoption is allowed, so should one fall in love with a particular cat come back at 3:00 when they close & the cat is yours. Since Jan. 2015, 27 cats have been adopted. All cats come from the Humane Society, so other cats are recruited (selected with care for this setting) as cats are adopted. Coffee drinks are the standard selections with the beans from two local roasters, West Bean Roasters & Cafe Virtuoso. The barista I met had begged the owner to work there (a cat lover, I assume). They do not accept tips, however, there is a tip jar for the local humane society. Drinks are ordered in a separate room from the cats (city code). There is a window for cat viewing while waiting for your coffee, but the only tables are in the cat room. Remember, you may have to wait for access to the cat room if there are already 20 humans in that room. The room is supervised by volunteers with a list of rules that we visitors must adhere to (see photo of rules). While the coffee is good, it’s more of a cat fix than a caffeine fix. And there’s no lingering for hours as the room is cleared from time to time while the cats are given a break. There’s an old saying: When the cat’s away the mice will play. 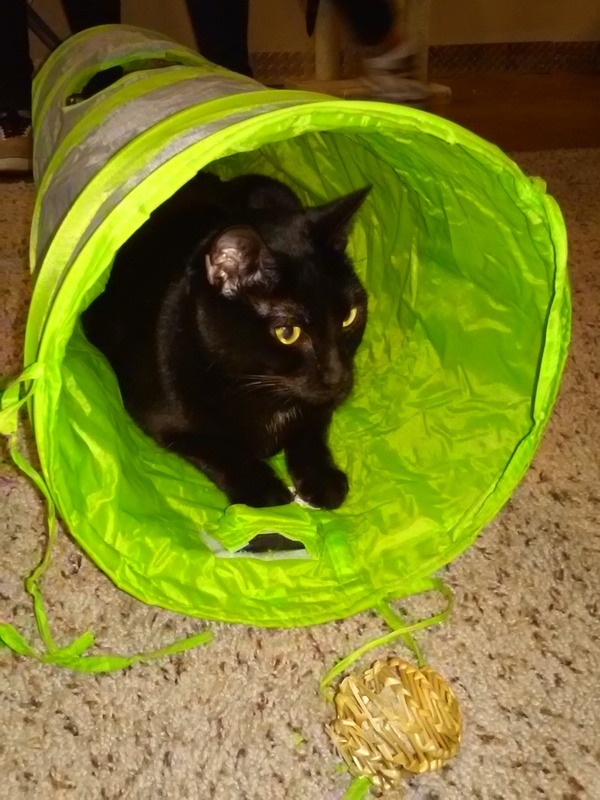 My blog partner is allergic to cats, so while she was away this mouse played with cats! 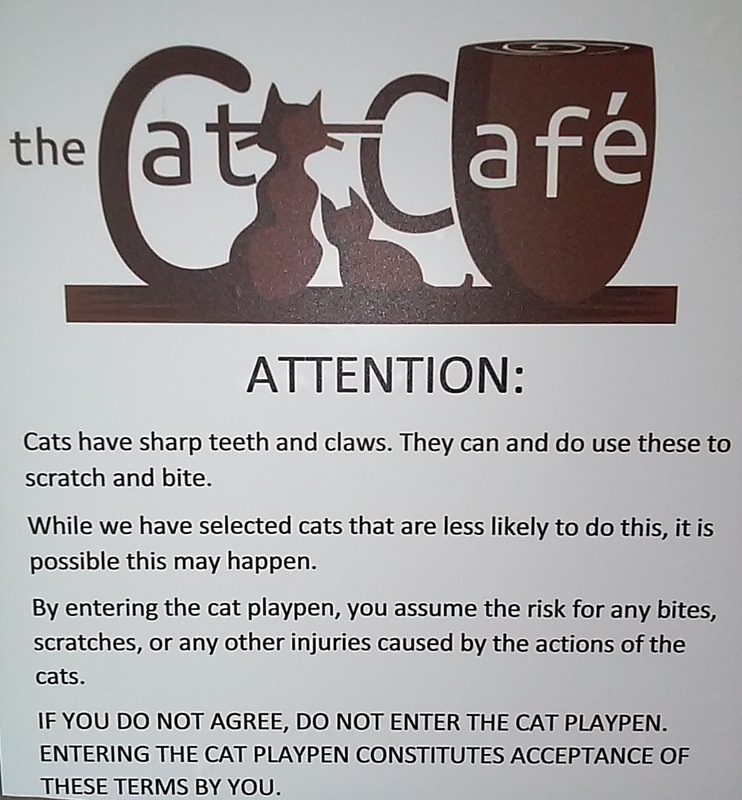 This entry was posted in cats, Coffee shops in San Diego, Uncategorized and tagged cats. Bookmark the permalink.